You may already be a podcast-lover, but have you considered getting your kids in on the fun? Podcasts are a great way to help cut-down on your kids’ screen time and get them interested in something new! One of the best things about podcasts is that they cover a huge range of topics, giving your kids plenty of opportunities to learn more about what they really enjoy. Listening to audio content is a great way to stimulate other senses and dive into a new way of entertainment and learning. Not only does this provide a new way to consume content, but it is also more likely that your children are to start a conversation about what they learned, as each episode opens up a whole new world of discussion and interesting facts to share with their friends and family. Podcasts are also great for bedtime stories, long road trips, or even just spending some quiet time after school. 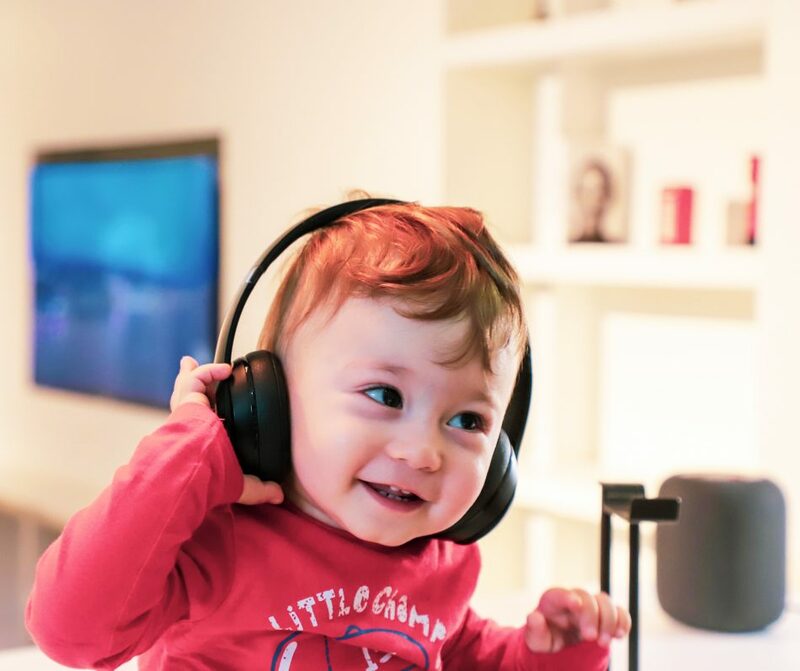 Recently we’ve had a lot of parents reach out to us asking which podcasts are the best for kids to listen to, so below is a list of great shows that are perfect for the kids and the whole family! The Sesame Street video podcast featuring the furry and loveable Muppets of Sesame Street. On the show, sing songs with Elmo, Abby, Cookie Monster and Grover. Kids learn about friendship, patience and sharing with Bert and Ernie. They get to celebrate the sunny days with all of their favorite Muppets with new episodes every Monday! WOW in the World Podcast is hosted by Mindy Thomas and Guy Raz who guide curious kids and their grown-ups on a journey into the wonders of the world around them. They go inside our brains, out into space and deep into the coolest new stories in science and technology. Brains On! is an award-winning audio show for kids and families. Each week, a different kid co-host joins Molly Bloom to find answers to fascinating questions about the world. Their mission is to encourage kids’ natural curiosity and wonder using science and history…but there’s no age limit on curiosity, and episodes of Brains On can be enjoyed by anyone. Peace Out releases short stories that help children calm down and relax by guiding them through visualization and breathing exercises. Their episodes are perfect for parents or teachers who want to teach mindfulness and self-regulation. Great for both children and adults alike. Story Pirates is a group of world-class actors, comedians, improvisers, and musicians who adapt stories written by kids into sketch comedy and musical theater. Visit www.storypirates.com for more information on Story Pirates and how you can bring our live show to your school or town! Little Stories for Tiny People is a children’s podcast featuring original audio stories that will delight the tiny people in your life. Perfect for bleary-eyed parents, innovative teachers, and at-wits’-end babysitters looking for an alternative and non-annoying way to engage the toddlers and young kids they love at bedtime or any time! Each story is lovingly written and performed with attention to the whimsical senses of humor children often possess. But Why, is a show led by kids! They ask the questions and they find the answers. It’s a big interesting world out there. On But Why, they tackle topics large and small, about nature, words, even the end of the world. Know a kid with a question? Record it with a smartphone and send the recording into the show to have your question answered! The Alien Adventures of Finn Caspian is a serialized science-fiction story for kids, told in 15-20 minute episodes for parents to put on when driving around town, or on those marathon road trips, or to bond over before bed. The story centers on Finn Caspian, an 8-year-old boy aboard The Famous Marlowe 280 Interplanetary Exploratory Space Station. He and his friends Abigail, Elias, and Vale are Explorers Troop 301, taking off from the Marlowe to explore uncharted planets, help the occasional alien, and solve a mystery that threatens to destroy the Marlowe. The story is written and performed by Jonathan Messinger, author of Hiding Out. His son Griffin, 7, serves as editor of the story, appearing in episodes to critique, make predictions and express skepticism that his father knows what he’s talking about! Do your children like listening to a story? Story Time has lots of great stories for everyone. Each story is usually less than 20 minutes long, hopefully just long enough to keep your toddler, preschoolers, and little ones engaged. Story Time is a free fortnightly audiobook podcast for children ages 2-13, perfect to turn at bedtime or during a ride in the car. The Book Club for Kids is a podcast where young readers meet to talk about a book. The show includes a celebrity reading from the book. Plus, the author joins us to answer your questions. The host is award-winning public radio journalist Kitty Felde. Book Club won the Literacy in Media Award. What if a tiny dragon lived in my closet? What if there were a never-ending bowl of ice cream? What if cats ruled the world? Join Abacus P Grumbler, Randall Radbot, and Whendiana Joan as they help Mr. Eric tell wacky stories inspired by your questions! Call in to leave a voicemail and be featured on the show. Ear Snacks is a musical podcast for kids about the world. Andrew & Polly and their friends consider music, science, art and culture in a fun-filled family-friendly podcast that parents enjoy and younger kids eat right up. The Past & The Curios is a history Podcast for Kids! Parents love them, Teachers love them, and most importantly, kids do too! History can be amazing, inspiring and relevant to anyone. On the show, they love to share the stories of Spies, funny foods, George Washington’s foibles, early advancements in cartooning and ballooning and much more! A professional music score and important songs accompany nearly every themed episode. The Dream Big Podcast is a family-friendly podcast inspiring kids (and adults!) to pursue their passions in life and take action to make their dreams a reality. The Dream Big Podcast’s short 15-20 minute format makes for the perfect length to listen to an episode in the car with your kids. The hosts, Eva Karpman (currently 7-years-old in 2nd grade) and mom Olga Karpman interview world-class performers who do what they love and live their dreams each and every day. They aim to invite guests who are extraordinary achievers from eclectic areas (think Olympians like Scott Hamilton, celebrity animal trainers like Zak George, other top podcasters like Dan Carlin and John Lee Dumas, Grammy-winning musicians like Taylor Swift and Lady Gaga, renowned scientists like Neil DeGrasse Tyson, successful entrepreneurs like Tim Ferriss, Ellen DeGeneres, and Oprah — we like to DREAM BIG too!). The Unexplainable Disappearance of Mars Patel is a high-quality serial mystery story for middle graders, performed by actual kids. Think Goonies, meets Spy Kids, meets Stranger Things for 8-12 year-olds. Listen along as eleven-year-old Mars Patel and his pals JP, Toothpick, and Caddie set out on an audacious adventure in search of two missing friends. The mysterious tech billionaire Oliver Pruitt might have a thing-or-two to say about their quest, because as he likes to say, To the stars! In fact, that’s just where they might be headed. The World of Buddy Pegs is a series of free original children’s audio stories for families who want to share the inspiration and empowerment of bicycling with the next generation. Each episode starts at the local bike shop Buddy Pegs which is run by two dogs who are on a mission to bring the power of the bicycle to all the animal characters who reside in the fictional town Spokesville. Listen in to the adventures of Sophie and Sebastian. Each episode is inspired by the author’s own children, as well as children’s classics such as Winnie the Pooh. These whimsical stories are sure to delight the whole family. The Saturday Morning Cereal bowl is a weekly, two-hour program of music for the entire family to enjoy. This isn’t simply kids music; it’s two hours of some of the best family music you’ve ever heard. So sit back with the kids and enjoy! Tumble is a science podcast created to be enjoyed by the entire family, exploring stories of scientific discovery. Each episode is hosted and produced by Lindsay Patterson (science journalist) and Marshall Escamilla (teacher) and is filled with great educational content. Created for children ages 8-12 (but loved by listeners of all ages), Adventures in Odyssey is a 30-minute drama that combines the faith lessons parents appreciate with characters and stories that kids love! The official podcast gives behind-the-scenes information on the show, gives deleted scenes and answers fan questions. Tune in to hear all the adventures! The Radio Adventures of Dr. Floyd is the first, and longest running, professionally produced audio drama podcast! This family-friendly new twist on “old time radio” features the adventures and exploits of the World’s Most Brilliant Scientist, Dr. Floyd! Join Dr. Floyd as he tries to thwart the plans of his evil arch-nemesis, Dr. Steve, all the while learning about the people and events that shaped the history of the Earth. The Podcast for Gifted Children and Adults! This is a wonderful selection. Thank you for providing...I wonder if you have any suggestions ..or if you came across podcasts created for kids who are interested in learning French as a second language? Something that maybe incorporates both English explanations of French words...and fun stories to go along with it to keep them interested...or something. Anyways, I have an 11-year old who would benefit. I'll keep searching on my own, but if you have any tips or pointers, I'd really appreciate it. And thanks again for the current list! I can't wait to sit and listen with the fam. We love WOW! In the world, Brains On, and Story Pirates. I’m excited to find some new podcasts to try out! I’m trying to find a kid-friendly news podcast. Any leads? Hi Great list of kids podcasts! Try Storiespodcast.com They are also amazing! I’d also like to recommend Spare the Rock, Spoil the Child! My almost 2 year old LOVES it! He gets so excited when he hears the theme music start up. It’s a music program. Where can I find ratings for podcasts? Is there something similar to the movies like G, PG, and R?